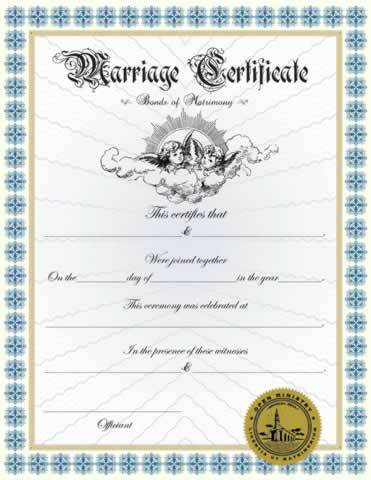 This personalized Marriage Certificate III can be pre-printed with names of the couple, date and location of ceremony, names of witnesses and person solemnizing the marriage. Decorated with our gold embossed ministry seal. The couple was so delighted at the quality and beauty of the custom certificate, and the cost was minimal for the speedy turn around, and was a nice gift to the newly weds. The custom certificate allowed them to include actual address of wedding and the witness names, gave more personal attachement to all included. Can't say enough good things about the quality of personalization and it looks awesome in a frame!!!! The service provided by Open Ministry has been prompt, accurate and courteous.